The success rate for our seminars is staggeringly high, over 90% based on our 3 month money back guarantee and independent scientific studies published in peer review journals indicate that even after 12 months the success rate remains over 50%. As well as telephone support after the seminar, we also provide free of charge back up seminars for the few that require them – these are provided as part of the money-back guarantee where this applies. If you don’t quit smoking, drinking or drugs after completing the program your fee is refunded in full. 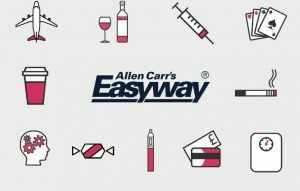 The seminars are effective regardless of whether you have previously used other Allen Carr’s Easyway products (such as our on-demand program, books or apps). The centers seminars will work for you – hence you still get the assurance of the money back guarantee (smoking, alcohol and drugs only).